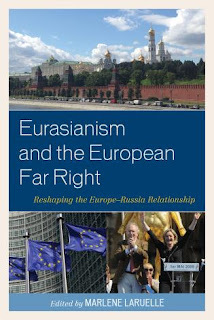 A new book on Alexander Dugin's Eurasianism and Europe has been published, Eurasianism and the European Far Right: Reshaping the Europe-Russia Relationship (Lanham: Lexington Books, 2015), edited by Marlene Laruelle and supported by the Carnegie Council. The book examines the three-sided relationship between the Russian government, European neo-nationalist parties and Eurasianism. 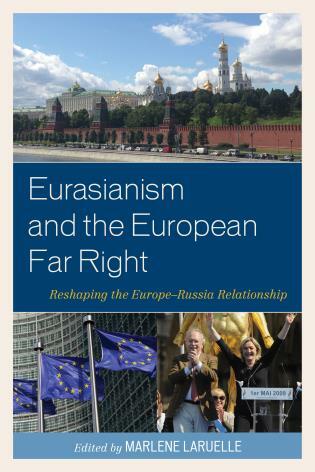 As David Speedie notes in the foreword, one important thing that is going on is "Russia's rising soft power among European parties and countries that feel victims of the European Union 'technocracy.'" To this might be added the impact of globalization, to which many also feel victim. Eurasianism is not synonymous with Russian soft power, but is an aspect of it. The book is a collection with ten chapters, two introductory and one by way of conclusion. The remaining seven chapters deal with Russia itself and with France, Italy, Spain, Turkey, Hungary and Greece. One introductory chapter is by Laruelle, and the other by Anton Shekhovtsov, who also wrote the conclusion. The other chapters are by scholars specializing in the countries they cover and/or in the New Right. The chapters on Turkey and Hungary are among the most interesting. Vügar İmanbeyli charts and explains Dugin's initially enthusiastic reception in Turkey, a reception that became less and less enthusiastic over time. Umut Korkut and Emel Akçali show how what is in some ways a Hungarian version of Eurasianism, Turanism, gained influence within Jobbik and even, to a lesser extent, Fidesz. Unfortunately lacking is a discussion of the current, as opposed to historical, importance of Traditionalism for Eurasianists and sympathizers outside Russia. Vadim Rossman recognizes the importance of Guénon and Evola for the Center for Conservative Research at the Moscow State University, which was until 2014 an important base for Dugin and colleagues, as well as of related thinkers such as Henry Corbin and the Neoplatonists. Beyond this, it is noted that Greece's Golden Dawn initially promoted paganism before shifting to Greek Christianity. Nothing more. Even so, the book is important. 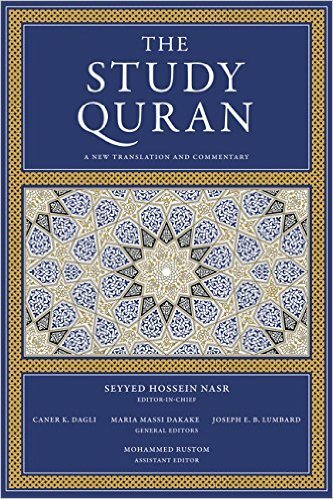 A new Quran translation and commentary has just been published by HarperOne, the fruit of a ten-year project headed by Seyyed Hossein Nasr, financed by King Abdullah II of Jordan and the El-Hibri Foundation, and carried out by "students" of Nasr, notably Joseph Lumbard. It seems that in this context "students" means followers, and that what we have here is thus a work of primarily Maryami scholarship. Not all those involved with the project, or endorsing the result, are Maryamis, however. The work is entitled The Study Quran: A New Translation and Commentary, the phrase "Study Quran" following the example of "Study Bible," meaning an edition of the Bbible with extra material designed to support serious study. The emphasis is on commentary, with far more words devoted to commentary than to the actual translation. This is in keeping with the approach of classical Islamic scholarship, which did not just "read" the Quran as a text in isolation, but interpreted and understood it in the light of intratextual and intertextual references and other sources. The intratextual references are, of course, to other parts of the Quran; intertextual references are mostly to the hadith; and the other sources are primarily other commentators. The Study Quran generally follows this approach, though there are occasional comments that go beyond it, as when it is noted that "the right is associated with righteousness and blessedness... in Arabic, as in numerous other cultural-linguistic systems." In general, however, modern non-Muslim scholarly interpretations and discussions are ignored. The Quran is a complex text that cannot be just "read," even in Arabic. Understanding almost any part of the Quran involves interpretation, which has to be based on something, whether a reader realizes this or not. What is true of the Arabic is even more true of a translation, as a translator needs to interpret before translating. A translation thus represents one particular interpretation, not the multiple interpretations that are possible on the basis of the Arabic text. A translation and commentary, then, allows a reader to understand different possible interpretations. The difficulty, however, lies in deciding which interpretations to include, and which views to favor. The commentaries used in The Study Quran include the major Sunni classics, as might be expected. Modern or Salafi interpretations are generally ignored, though reference is sometimes made to Sayyid Qutb. Many Sufi commentators are included, as are some notable Shi'i commenters. On this basis, then, the commentary might be described as "traditional Sufi" and "Shi'i-Sunni," an unusual combination. Sometimes the commentary lists alternative understandings, and sometimes it cites particular commentaries. Sometimes, however, it merely gives the views of "most commentators," without identifying them or the dissenting views. This makes sense, as The Study Quran is already 2,048 pages long. It does mean, however, that in the last resort this commentary, like all commentaries, reflects the positions of its composers. Perhaps inevitably under current circumstances, The Study Quran was reported by CNN not as a massive work of scholarship involving some unusual perspectives, but as a tool in the war against extremism. Some critics therefore responded to it in these terms, asking how terrorists were to be persuaded to use The Study Quran. This, of course, is not the real point. A sample of The Study Quran may be downloaded here and another sample may be read on the work's dedicated website. My thanks to JP for bring this translation to my attention. Apologies to everyone for the long silence. This was while I was finishing a new book. More details in due course. 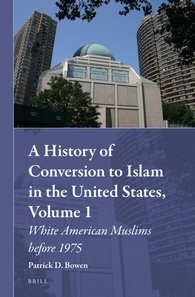 A new book, Patrick Bowen's A History of Conversion to Islam in the United States: White American Converts before 1975 (Brill, 2015), does not deal directly with Traditionalism (though Guénon is mentioned) but does deal with various topics that are part of the background to Traditionalism, and part of the background to Sufism and Traditionalism in the United States. There's lots on the Theosophical Society, on Martinism, on early neo-Sufis, universalism (if not exactly perennialism) and on changes in attitudes to religion in the nineteenth century. A good book, recommended. Just discovered: a small Traditionalist group in 1930s Thailand, described by Arthur Osborne in My Life and Quest (2001), available online. Osborne was introduced to the works of Guénon by Martin Lings, who he knew in Gdynia, Poland before the Second World War. Lings gave him two books, one by Guénon and one by Gurdjieff's interpreter P. D. Ouspensky. It is interesting that Lings was recommending Ouspensky at that point. Guénon's book, the Introduction générale à l'étude des doctrines hindoues had a great impact on Osborne, and Ouspensky did not. When he moved from Poland to Bangkok, Thailand, Osborne joined a small group of Traditionalists there, evidently all Europeans. He also became Muslim, joined an Indian dhikr group in Bangkok, and gave bayat to an unidentified shaykh in India in 1939, along with a number of other Bangkok Traditionalists . It is not clear what happened to the Bangkok group. Osborne's final destination lay outside it. As the Second World War started and Thailand was threatened by the Japanese, his wife and daughter took refuge in India, where his wife was given "silent initiation" by the Hindu guru Ramana Maharshi, of whom Guénon did not approve. Osborne spent much of the war in an internment camp in Thailand, where he intended to devote himself to "prayer, meditation, incantations and reading the Arabic Quran," but as time passed found himself returning to "profane" life. After the war, he re-joined his family in India, and took Ramana Maharshi as his guru. He edited The collected works of Sri Ramana Maharshi, first published by Rider in 1959. My thanks to B. H. for bringing Osborne's book to my attention. Just out: a new French collection edited by Philippe Faure, René Guénon. L'appel de la sagesse primordiale (Paris: Le Cerf, 34 €, ISBN 9782204098892). That is, René Guénon: The Call of Primordial Wisdom. This collection brings together all the leading French specialists on Guénon, generally academics, some engaged and some less engaged. It promises to be a major work. Xavier Accart, "The reception of the work of René Guénon by the literary and intellectual circles of his time." Patrick Laude, "Traditional Sources and contemporary contexts." Jean-Pierre Laurant, "The Guénon/Coomaraswamy correspondence or reciprocal exchange." Matthias Korger, "The picture of René Guénon in the writings of Leopold Ziegler and André Préau." Jean Moncelon, "René Guénon and Louis Massignon: The calls of the Orient." Jean-Louis Gabin, "René Guénon and Alain Daniélou: A witness and his parody." Jean-Marc Vivenza, "René Guénon and metaphysical knowledge." Jean Borella, "René Guénon and philosophical 'error.'" Philippe Faure, "René Guénon and the Bible: The way of symbols." Paul B. Fenton, "René Guénon and Judaism." Jean-Pierre Brach, "Christianity and 'primordial tradition' in the articles of René Guénon for the Catholic magazine Regnabit." 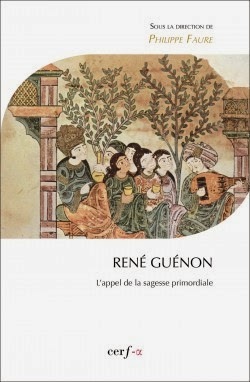 Paolo Urizzi, "The presence of Sufism in the work of René Guénon." Patrick Ringgenberg, "Primordial tradition and universalism according to Frithjof Schuon and perennialism." Jérôme Rousse-Lacordaire, "Traditional thought and Christian theology of religions." Luc Nefontaine, "Hate and/or veneration? Ambivalence of the image of René Guénon in Freemasonry today." Seyyed Hossein Nasr, "The influence of René Guénon in the Islamic world." Bruno Pinchard, "The spatial symbolism of René Guénon and its mathematics." Éric Phalippou, "Ethnology from within: A 'semi-secular' discipline?" JacquesViret, "Music and Tradition: The traditional perspective in musicology and ethnomusicology." After almost nine years of existence, this blog has passed 250,000 page views. It was started in June 2006 to make available additions to my book Against the Modern World, and has since become a general source of information on the topic of Tradiitonalism and the Traditionalists. This topic, as the number of page views shows, is one that many people find of interest. 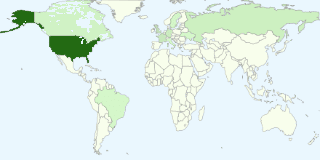 The stats report that 45% of these 250,000 page views were by users in the US, UK and Canada, mostly in the US, as the map indicates. This is not surprising for an English-language blog. The next seven countries, in order, have been France, Germany, Russia, Sweden, Brazil, Ukraine, and Italy. It is hardly surprising to find France and Italy on the list, given the national origins of René Guénon and Julius Evola, or to find Russia and Ukraine on it, given the prominence there of Traditionalism and of Alexander Dugin. The prominence of Germany and Sweden is unexpected, however, as is the prominence of Brazil. The current state of Traditionalism in those countries evidently deserves investigation. In the mid-1980s a group formed within CEDADE that devoted itself to esoteric Hitlerism and the study of the works of Miguel Serrano, whose works (and other esoteric Hitlerist texts) were published in the CEDADE-affiliated journal Excalibur. Amid internal factionalism in the late 1980s, members of this group left CEDADE to form their own more esoteric organization, which they called the Thule Group. In the beginning of the 1990s the Thule Group began publishing a journal entitled Hiperbórea. Dugin, presumably through his travels to Spain in the early 1990s, met members of the Thule Group and in 1991 published the Russian version of volume 1 of Hiperbórea, which he entitled Giperborea. I am wondering which members of the Thule Group Dugin was in contact with. I am also interested in receiving any information anyone might have on who was involved in the Thule Group, when it started, what its publications were and where I could find them, and any other information that exists on this faction. I can be reached at emily.efland@yale.edu. Washington got the wrong man? In an article just published in Foreign Affairs, "Scared of Putin's Shadow," Marlene Laruelle argues that "in sanctioning Dugin, Washington got the wrong man." Dugin, she argues, is not that important, and neither is ideology. "By putting Dugin ... on the sanctions list, the United States is essentially conveying that it ... truly believes that nationalistic ideology is the dominant motivation for Russia’s position on Ukraine. If that is correct, then the United States dangerously misunderstands Putin’s strategy ... Moscow’s involvement in Ukraine is primarily strategic." "The United States has issued a new list of individuals and entities to be sanctioned over Russia's interference in Ukraine, including Kremlin-connected nationalist ideologue Aleksandr Dugin and former Ukrainian Prime Minister Mykola Azarov. "The Treasury Department on March 11 also sanctioned a bank in Crimea -- the Russian National Commercial Bank -- two other former officials from the government of ousted Ukrainian President Viktor Yanukovych, eight Ukrainian separatists, and two other leaders of Dugin's Eurasian Youth Union. "Any U.S. property held by those individuals is frozen, and U.S. citizens are prohibited from doing business with them. The United States took the action to "hold accountable those responsible for violations of Ukraine’s sovereignty and territorial integrity." Russian FSB chief Aleksandr Bortnikov, who has been targeted by sanctions in the EU and Canada, was not on the list of individuals targeted by the Treasury Department in this latest round of sanctions." Soumission (Submission), the new novel by the controversial and best-selling French novelist Michel Houellebecq, has been widely identified (especially in the English-language press) as Islamophobic, but might better be described as Traditionalist. 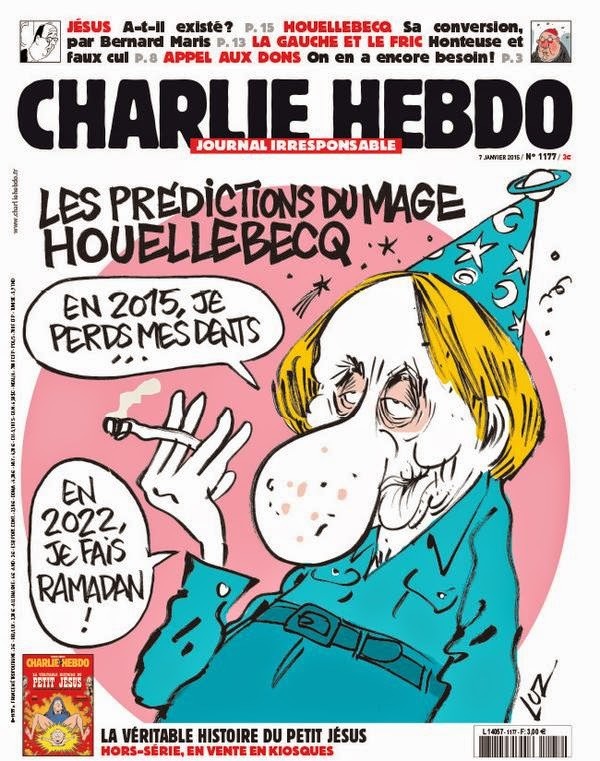 Houellebec and Soumission were featured on the January 7, 2015 cover of Charlie Hebdo (shown here). Houellebecq's novel was selling well even before the Charlie Hebdo cover and attacks, has since become even better known, and is due out soon in English translation. Perhaps the book's incidental link to Charlie Hebdo helps explain its identification as Islamophobic. The book certainly features the election of an Islamist as president of France and the consequent Islamization of some aspects of French life, a scenario reminiscent of the Eurabia about which writers such as Bat Ye'or have been warning. However, these events are not the book's main subject. National political events are the background against which the book tells its real story. The book's real story is the decline and redemption of the narrator, François, a literature professor and expert on Joris-Karl Huysmans (1848-1907), author of À rebours (1884). The novels of Huysmans are partly autobiographical, and the redemption of Huysmans was found in Catholicism. The story of Houellebecq's hero François evidently echoes some aspects of the life of Houellebecq himself, and certainly echoes Huysmans. The difference is that François finds his redemption in Islam. And his path to Islam runs through identitarian Traditionalism. Two of the book's characters are or have been involved in the mouvement identitaire, the "identitarian movement." Houellebecq does not explain this movement, but it will be familiar to some readers of this blog as that section of the New Right that emphasizes traditional cultural identities (as against globalized multiculturalism), is partly inspired by Traditionalism, has been further developed by thinkers such as Alain de Benoist and Guillaume Faye, and acknowledges Alexander Dugin. Both of Houellebecq's characters with connections to the identitarian movement are presented sympathetically. One, Robert Rediger, is a major character in the book, the Islamist president of the Sorbonne and later a minister in the Islamist government of France. Houellebecq's Rediger wrote his PhD thesis on Guénon and Nietzsche, and converted to Islam when he concluded that Catholicism had lost the power to regenerate a fallen West, and that the future lay in Islam, as Guénon had shown. These ideas are developed at some length in Soumission, and are the book's philosophical heart. They are simplified Traditionalism: Traditionalism because they acknowledge Guénon and identify modernity as decline and tradition as the solution, and simplified because they make no mention of perennialism or of the esoteric. Houellebecq's Guénon was a convert to Islam, not a Sufi. In the end, the real topic of Soumission is probably the decline of the West, and specifically of the French Left, not Islam. Houellebecq does not in fact seem particularly interested in Islam, which he seems to understand primarily in terms of polygamy. Houellebecq's Islam does not stop anyone from drinking good wine. His book, however, shows how Guénon's work is assuming new relevance as Europe's political landscape changes. My thanks to Bertrand for drawing my attention to Bouddhanar's post "Michel Houellebeck lecteur de René Guénon" and thus to the Traditionalist content of Soumission. Questions are being raised (for example, in the FT) about relations between Alexander Dugin (right in photo) and the new Greek foreign minister, Nikos Kotzias, (left in photo). 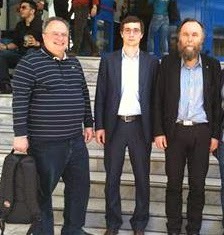 Kotzias, a Communist in his student days and then a successful professor of international studies before his appointment as foreign minister, hosted Dugin at the University of Piraeus in 2013. The transcript of this event tells us little of the views of Kotzias, who chaired the session and said little, other than to compare the European Union to an empire. That Kotzias is hostile to the European Union and its recent policies regarding Greece should come as no surprise: that is after all the whole point of the elections that have just brought Kotzias and colleagues to power. There are signs of Kotzias and colleagues inclining towards Russia, including Prime Minister Alexis Tsipras choosing the Russian ambassador as the first foreign official he met after his appointment, and the stance he is adopting against EU sanctions against Russia. There are, however, no obvious signs of them tending specifically towards Dugin's version of Eurasianism, and The Economist is probably right to conclude that "there is no basis for religious determinism in diplomatic history... [but] when the diplomatic stars are aligned, common cultural and spiritual reference points can give added resonance to a relationship." As readers of Guénon well know, the concept of the kali yuga or dark age is central to his thought, and thus to Traditionalism as a whole. An excellent new article on the Hindu origins and European uses of the concept places its development in a wider context. The article is Luis González-Reimann, "The Yugas: Their Importance in India and their Use by Western Intellectuals and Esoteric and New Age Writers," Religion Compass 8 (2014), pp. 357–370. González-Reimann argues that the concept of the kali yuga is a late one, emerging in India only around the first century AD, when it helped to explain the various disasters then afflicting the classical Vedic system. It became known in Europe during the seventeenth century, but did not attract much attention until the eighteenth century, when Voltaire was among those interested in it, and in the challenge that the system of the yugas presented to established Christian chronology. The intellectual mainstream soon lost interest, however, according to González-Reimann because of the impact of a refutation by Sir William Jones. In fact, I suspect, it was also because chronologies based on geology were then beginning to render all other varieties of chronology obsolete. Even if the intellectual mainstream lost interest in the yugas, esotericists did not. The yugas featured in the work of Antoine Fabre d'Olivet (1767-1825), who suggested that the Hindus had got them the wrong way round and that the kali yuga was actually the best of the four yugas. They then appear in the work of Alexandre Saint-Yves d'Alveydre (1842–1909), who agreed with Fabre d'Olivet that the yugas were actually improving. Helena Blavatsky, Annie Besant and Rudolf Steiner all wrote about the yugas, following Saint-Yves d'Alveydre's optimistic view. Besant emphasized the coming new age of the satya yuga, and Steiner even held that the kali yuga ended in 1899. Saint-Yves d'Alveydre modified the standard Indian understanding of the yugas, equating the mahāyuga with the manvantara, two measures of time that classically belonged to different systems, and were far from identical. Guénon follows Saint-Yves d'Alveydre in this, which indicates his proximate source. Guénon differed from the esoteric norm, however, and most importantly, in reverting to the original emphasis on the negative nature of the kali yuga itself. And the rest, as they say, is history. Once again, we see how Traditionalism owes much to mainstream esotericism, but also differs from it. All this is shown clearly by González-Reimann in his article, which closes by observing that "in the second half of the 20th century, esotericism largely morphed into New Age thinking, or ... the New Age engulfed esotericism. Either way, such ideas [as the yugas] ... have been incorporated into the manifold spectrum of New Age thought." Yes, perhaps, so far as optimistic understandings from Fabre d'Olivet and Saint-Yves d'Alveydre to Besant and Steiner are concerned, but no so far as the Traditionalist understanding is concerned.